Last night I came to the realization of what makes a band great. Trends come and go, and the fickle legions of musicians and showgoers will sheepishly subscribe to the flavor of the month. Hell, entire bands start and break up within a year to grab the trend. How superficial this can be. What makes a band great is their immunity to this cycle. When a band looks at how the trends are going and just says "no thanks, we're going to do what we do best", and...they end up producing material that blows away all the flavor of the month bands. Ampere is showing us how it's done with "Like Shadows". 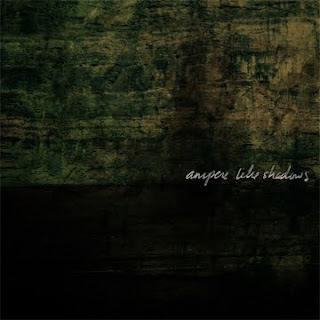 Ampere is one of those bands that has a very specific sound. There is only one Ampere and when you hear a song by them you instantly know it's them. This band has carved out a reputation of winning over even the most fickel brand of scenester with their short, blasty brand of melodic chaos. This record follows suit with the band's previous releases, but I might say it's goes a step further in perfecting their craft. "Of Nightmare and Reality",one of the few songs breaking the one minute mark, gives you an idea of how the band can stretch a part out and put a riff to work in comparison to their usual style. "The Submerged Tenth" is another stand out track to me. I love the guitar line and how the off time drums and bass float behind it before blasting right back in to some technical chaos. The last song on the record "Tiny Victories" even manages to provide some anthem-like sing a long material to break up the chaos and end the record on a very powerful note. At just over 13 minutes you get quite a whirlwind of song structure, frantic musicianship and deseperate vocals within these 15 songs.